An industrial project as immense as the construction of Boulder (later Hoover) Dam involves the transportation of huge amounts of materials, both raw and processed. In the case of a dam, raw materials include rock, limestone, gravel, and other bulk commodities best handled by rail; cement is probably the most obvious of the processed materials needing handling. For Boulder Dam, this ultimately required the construction of a railway through terrain as forbidding as that faced by any narrow gauge mountain railway. Starting from a connection with the Union Pacific's Henderson branch, it climbed through Railroad Pass to Boulder City, then ran along the south wall of Black Canyon, requiring several tunnels along the way, and ultimately descending through a final long tunnel to the canyon floor to reach a huge cement plant. Ultimately the rising waters of Lake Mead inundated the cement plant and associated trackage, and the tracks from there to Boulder City were abandoned. 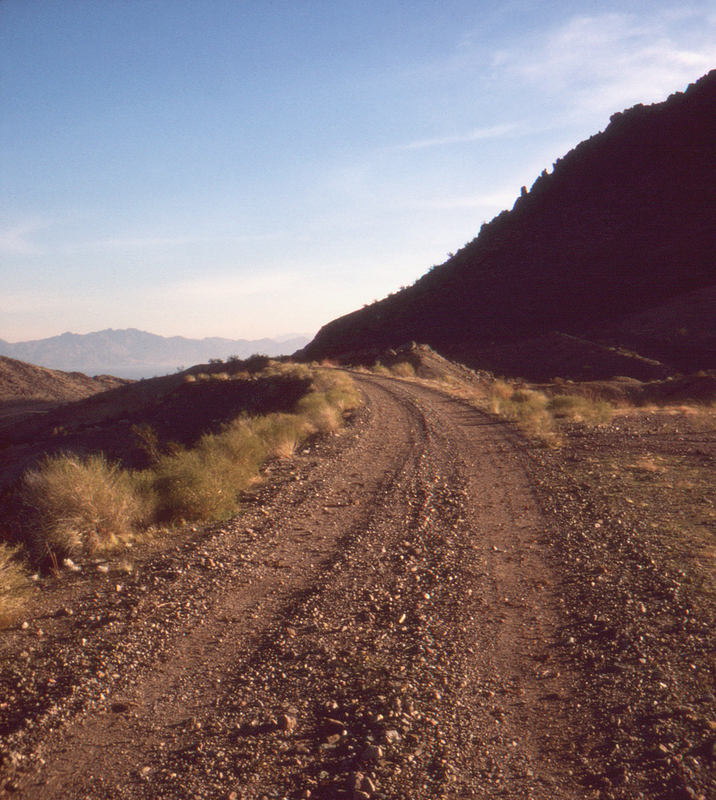 Here, south of Lake Mead, the lake can be glimpsed in the distance past the abandoned grade. The tracks from Henderson to Railroad Pass have been out of service for many years, but those from the pass to Boulder City remain in use today by the Southern Nevada Railroad Museum.